To create your Custom Katana, select your customizations from the drop down menu, add any optional extras and we will take care of the rest! 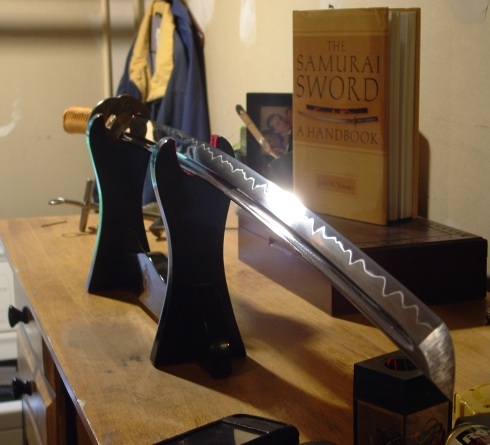 "An SBG Exclusive - design your own custom Katana!" Now in it’s third generation, the SBG Custom Katana by the SBG Black Dragon Forge has been in production and continually refined since 2008. 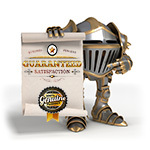 What you will receive is the most current, up to date, upgraded version - the custom Katana 3.0 - taking advantage of all those years of experience to deliver the very best possible quality product, your way. In all cases the basic blade your design will be built upon is a high quality differentially hardened and traditionally clayed T-10 Tool Steel blade (my personal favorite steel for differentially hardened Katana). 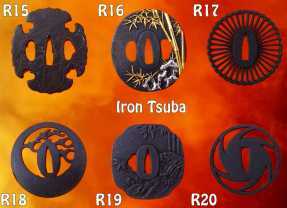 However YOU select the length of the blade, whether or not you want it fullered, choose the fittings (either iron tsuba and a matching fuchigashira that you like, or upgrade for free to an elite hardened copper based, gold and silver plated pre-matched set), select the color and texture of the ito, choose black or white same (rayskin) and the finish it up with your saya of choice to create your own unique personalized design! - all for one flat rate..! * Blades are available in 3 lengths. You can choose on personal preference or referenced to height and reach. As a general guide, 27" is good for people under 5'3", 28" suits most other people and 29" is best for the taller practitioner. Please note, our swords are measured in the TRADITIONAL way (nagasa) from the tip of the kissaski to the batch notch of the habaki. 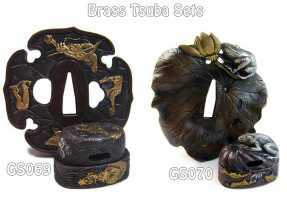 Some sellers measure from the TSUBA, which adds an extra inch to the length they say the blade is. So please bear that in mind when deciding on the total length. Available with a traditionally finished and correctly shaped bo-hi termination for a faster, lighter blade (emphasis on speed) or solid bodied for a more durable, forceful cutter (emphasis on cutting power) as per your preference. 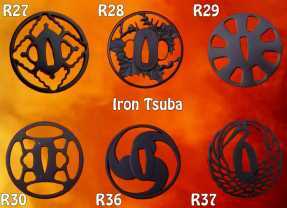 * Tsuba's on the Custom Katana 3.0 use only premium grade tsuba made from either iron or hardened copper with real gold and silver plating. Naturally, the blackened iron fittings are very solid, even the more delicate designs are surprisingly strong. If you prefer something more ornate, traditional hardened copper pre-matched sets are also available in a number of very unique and popular combinations at no additional charge. 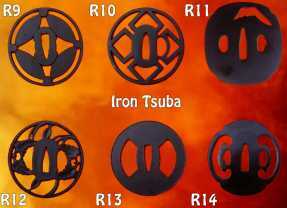 Iron tsuba are automatically matched to a neutral (black) solid iron fuchigahsira set. 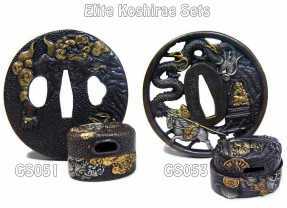 Menuki are included with all swords, but selected by the forge to match the set. They cannot be specified, what you get is the luck of the draw but they will be premium grade brass or copper. 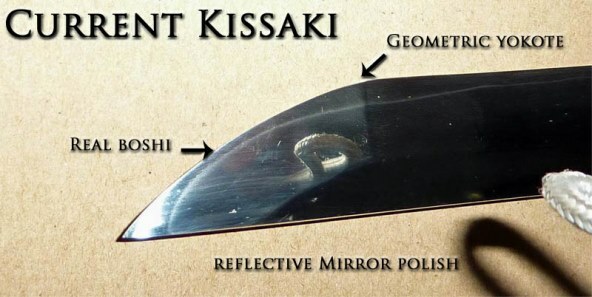 * Version 3.0 of the SBG Custom Katana comes with a premium kissaski with real geometric yokote ridge line, boshi and the same level of reflective polish as the blade itself. For the sake of example, let’s say you want to make a sword you will call the ‘Crimson Tiger’. So you select a 28” standard length blade with the solid bodied option (as you want a forceful cutting sword), pick the G35 Tiger Spirit Elite Set, select black cotton ito with standard white rayskin and finish it all off with a crimson saya. Satisfied with the design, you submit your order to the batch. Step 2: We will check your order and send you an email within 1-2 business days confirming your customizations along with a rough computer generated mock up image of what your color combinations will look like. So in the case of our Crimson Tiger example above, we’d send you a picture that looks like this. This picture is more a general ‘color scheme’ check for you (it doesn’t take into account details like the bo-hi or blade length or any optional upgrade options you may purchase). But it at least gives you a rough idea of how the various components will ‘gel’ and come together. The forge knows that SBG batch orders are special, and THEY want OUR repeat business, so they do put more effort into our batch than they would if you were to order a single sword by yourself. But at the end of the day: if you aren’t happy when it comes in, we will do what it takes to make it right for you. Happy designing – the forge and I look forward to bringing your final design to life! 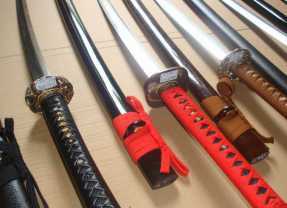 Blade Length: Select from 27-29” (measured from back notch of habaki – if measuring from tsuba for comparison to other swords, add 1”). Weight: From 2lbs 2oz to 2lbs 10oz depending on if a bo-hi is selected or not (bo-hi is lighter) and style of fittings selected. 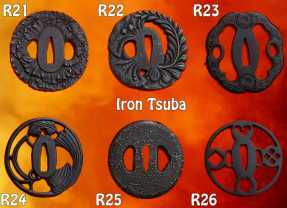 Point of Balance: 4.5 to 5.5” from the tsuba depending on bo-hi/no-hi and style of fittings selected. 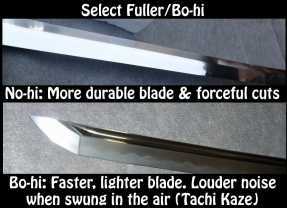 Thicker fittings and a bo-hi will create a very fast sword. Light fittings and no-hi will create a sword with a strong cutting action. Balance and design to your personal taste. Designed for traditional cutting practice. Also suitable as a high quality display sword or family heirloom. Solid bodied blade. 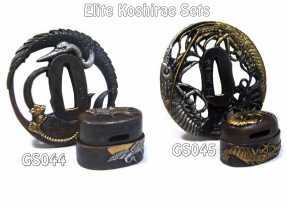 051 elite koshirae. Extra options I bought were leather wrapped tsuka, folded blade, and rayskin wrapped saya. Sword was mostly correct upon receipt. 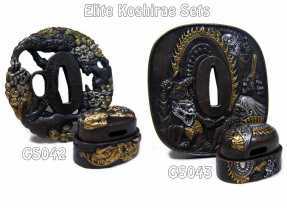 The kashira wasn't as pictured but still matched the theme of the tsuba and I liked it just as well. 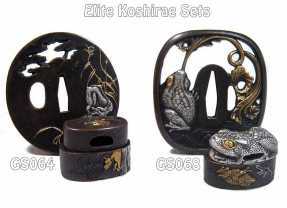 The menuki used ended up matching the lion dog theme of the rest of the koshirae too so I was very pleased with that. So for this part of the review I give the sword "coming as ordered" a 5/5 with a point taken off for the kashira not being exactly as pictured but a point gained for the extra effort of using a matching menuki (which they have clearly stated that you "get what you get"). Sword arrived just over 4 months after purchase. Paul was very good about keeping me informed of the progress and it arrived in new condition. 5/5 here too. Now on to my opinions of the sword itself. I'm going to do my best to compare it to swords at a similar price point. Here we go. 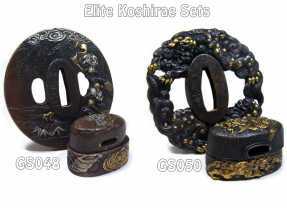 Fittings: The tsuba, fuchi and kashira are pretty nice. The gold inlay is pretty well done. Especially for the price. 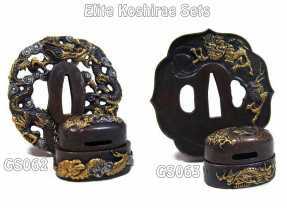 I think my fuchi was installed backwards as all of the detail and design is on the ura side and the omote side is blank. The habaki has some pretty large gaps between it and the blade. A fingernail could slide in between them toward the edge end. 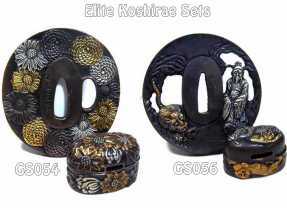 Everything looks nice but 3/5 because of the fuchi and habaki not really having the attention to detail that I would expect even at this price. Tsuka and Ito: I opted for the leather ito and black rayskin. The rayskin nodes are very small but there isn't any exposed wood or anything so I'm happy with the panels. The ito is tight and with the hishigami it has nice, even diamonds. 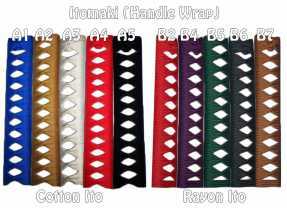 However, the wrap covers up about half of both of the mekugi on both sides. Because of this, I don't think I would be able to remove the tsuka without unwrapping it (which I have no experience with). I don't generally take my swords apart anyway but it's nice to have the option. 4/5 here only because of the mekugi peg issue. Overall 4/5. If this is one of your first katana I think you will be quite impressed and I doubt you'll find much fault with it. The look and quality at first glance are both superior to other options at this price. The blade is especially nice and I think even the most picky collector or practitioner would be impressed with the blade. However, if issues like the habaki not being flush with the blade or the saya not fitting well are common, then I think calling this an "heirloom piece" is a bit of a stretch. I'm happy with the purchase overall and recommend it. 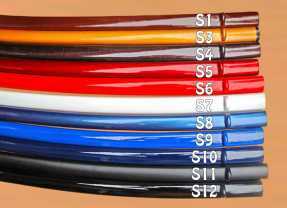 Picking your koshirae is fun and it is a very reasonable price. I got the options I selected and the issues I had with my katana are pretty common in the production sword world. Sometimes it's a dice roll and it seems every sword has at least one flaw. At least that's been my experience. Our responseGreat review - just wanted to make a quiet comment on the Saya. Saya are of course made from wood, and there can be huge and sudden changes to the temperature, humidity and atmospheric conditions from where the sword is made, where it is inspected, and where it finally ends up - and the wood can either shrink or expand slightly - creating an overly tight or overly loose fit. Over time, as the seasons change and the wood adjusts, it should gradually begin to revert to the correct fit (the inspection team check for this kind of thing, in the whole batch we had one with a slightly loose saya, all others were perfect at the time they were shipped). If it is stubborn, you can manually adjust the fit with some minor filing of the mouth of the Saya, but it should also become easier to draw over time as well. Its quite frustrating for us, but could be worse (I have heard some horror stories of custom guitars made by world famous artisans arriving completely warped from atmospheric changes in transit) - the only way around it would be to make the saya from plastic, but of course, no one wants a plastic Saya.. So it is just one of those things, 95% of the time its okay. But the other 5%, we just don't know the environmental conditions a given sword will be subjected to when in transit, so despite our best efforts, slightly loose or slightly tight fitting Saya are just part and parcel of sword shipping I am afraid.